What are Skin Delight Caps? How has Skin Delight Caps helped others? How do I use Skin Delight Caps? Since ancient times, humanity has been searching for the answer: how do we stop the aging process? From the time we are born, we are growing constantly and getting older. Aging is a rather mysterious process – and no definitive cause has been found – it seems to be a collection of factors within the body working together. Healthy skin is arguably the most sought after physical trait in today’s times. Healthy skin is supple, radiant and soft to the touch and seems to ‘glow’. Best of all - healthy skin can make one look years younger! The skin is flexible, waterproof and covers the entire outside of the body. It performs several important roles such as a sensory mechanism for feeling sensations such as heat, cold, as well as socio-sexual and emotional sensations. It regulates body temperature and prevents tissue fluid loss from the body. Fluid loss in the skin leads to dry skin and a wrinkled appearance. The skin is made up of three layers – the epidermis, dermis and subcutaneous tissue. The epidermis is the thin outermost layer of the skin that serves as a waterproof barrier to the environment. Under the epidermis is a thicker layer of skin called the dermis that contains collagen and elastin to keep the skin firm and flexible (giving it a supple appearance). Deeper in the dermis are sweat glands that connect to the surface of the skin through narrow, spiral-shaped sweat ducts – these are called the pores of the skin. The sebaceous glands secrete an oily substance called sebum that moisturizes the skin (keeping it soft). The subcutaneous layer, also referred to as the subcutis, is a layer of fat and connective tissue that consists of larger blood vessels and nerves. This layer regulates the temperature of the skin itself and the body while protecting other organs from injury by acting as a ‘shock absorber’. For many years people have made use of synthetic ingredients and chemicals in skincare and cosmetics. Nowadays, people are becoming more proactive about their health and there is an increasing demand for pure, natural products for skincare and cosmetics. There is a lot that can be done to support healthy skin. Avoiding areas of smog and air pollution and cigarette smoke can help stem the breakdown of collagen in the skin. Sun exposure is enemy number one – so wear sunblock everyday (even when you are not going to the beach!). Alcohol in moderation can minimize wrinkles and natural gentle face washes cab help to cleanse the skin of dead surface cells. Natural remedies have been used in traditional medicine for thousands of years to support healthy, supple and firm skin from within. Herbs have also been shown to support the skin through scavenging abilities on free-radicals and by possessing anti-oxidant properties. (Stajner, D., Popovic, B. M., Canadanovic-Brunet, J., and Boza, P. “Free radical scavenging activity of three Equisetum species from Fruska gora mountain”. Fitoterapia 2006;77(7-8):601-604)(Ho CT, Wang M, Wei GJ, Huang TC, Huang MT. “Chemistry and anti-oxidative factors in rosemary and sage”. Biofactors , 2000;13(1-4):161-166). Skin Delight Caps is a 100% safe, non-addictive, natural herbal and homeopathic remedy formulated by a team of experts in the field of natural medicine. This combination remedy has been used for many years to safely maintain the health and systemic balance of the skin. Skin Delight Caps supports the healthy functioning of the epidermis and skin tissue, thereby helping to support healthy, firm, supple skin. Rosmarinus officinalis (Rosemary) is well-known in modern herbalism as an all round tonic and energizer. Studies have also suggested that Rosemary may have beneficial properties for body cells with regards to oxidation of cells. (Ho CT, Wang M, Wei GJ, Huang TC, Huang MT. “Chemistry and anti-oxidative factors in rosemary and sage”. Biofactors , 2000;13(1-4):161-166). Kali sulph D6 - is a biochemic tissue salt that supports the distribution of oxygen throughout the body and to each individual cell and helps to maintain health in all cell membranes, supporting the natural regenerative processes of the skin. Kali sulph. is also of great benefit in the maintenance of healthy skin. Silicea D6 – used to address matters of the skin, such as a dull lackluster complexion. Skin Delight Caps contain no gluten, artificial flavours, colours or preservatives. It is suitable for vegetarians and safe for all ages. Take 1 - 2 vege-capsules two to three times daily as a nourishing and rejuvenating skin tonic. May be used together with AdaptoZen and Bio-Oxidate Defense. Safety during pregnancy and breastfeeding not established. Please consult your medical practitioner should symptoms persist. Results may vary, due to a number of influential factors. Over time, usually 3-6 weeks Skin Delight Caps will act in a supportive capacity to healthy skin and epithelial tissues, with some individuals responding sooner than others. Best results are achieved when Skin Delight Caps is used consistently and the recommendations regarding diet and consistent discipline are followed. 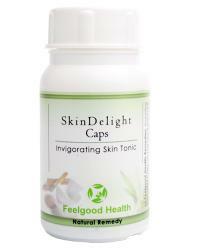 One bottle of Skin Delight Caps contains 60 vege-capsules - at the recommended dosage will last approximately 30 days. Pretty skin: Internal skin capsules plus herbal daily face wash!